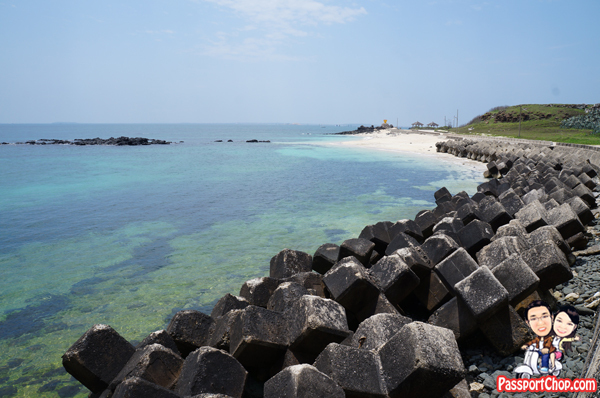 The many small islets in the north of the Penghu archipelago is known collectively as the North Sea Islands – they are popular with tourists because of their white-sand beaches, basalt formations as well as sea sports activities. The largest and most popular islet, Jibei 吉貝 is well-known as a water sports heaven. After a long day of touring around Penghu main islands 澎湖環島逍遙遊, our day 2 at Penghu brought us to explore the North Sea Islands, specifically Jibei Island 吉貝. 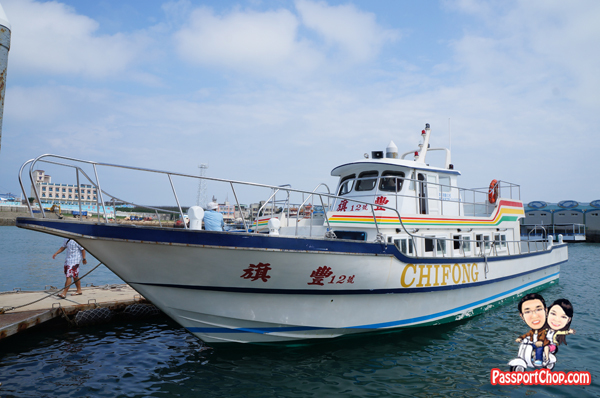 All boats to Jibei Island 吉貝 depart from ChiKan Harbour (往赤崁碼頭). The boat journey to Jibei Island (搭乘快艇前往吉貝) will take about 18 minutes. The return tickets cost about 300 NT. 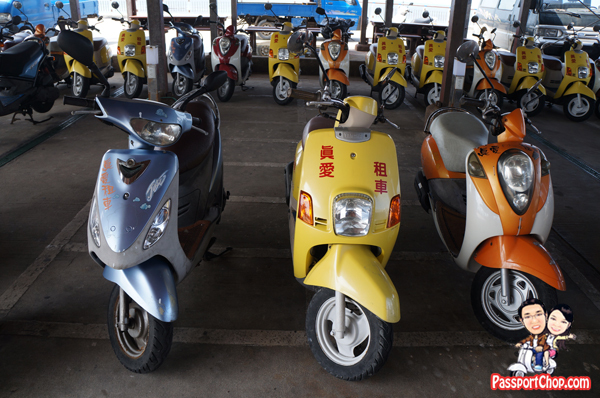 There isn’t public transportation on Jibei Island so the only way to get around the island is by riding on scooter bike (騎乘機車), cycling or walking. The third option is not feasible as you will be walking for a long time to get to various sights on the island. There are a lot of scooter rental shops just beside the harbour where you alight so take your time to check the prices and conditions of the scooters. 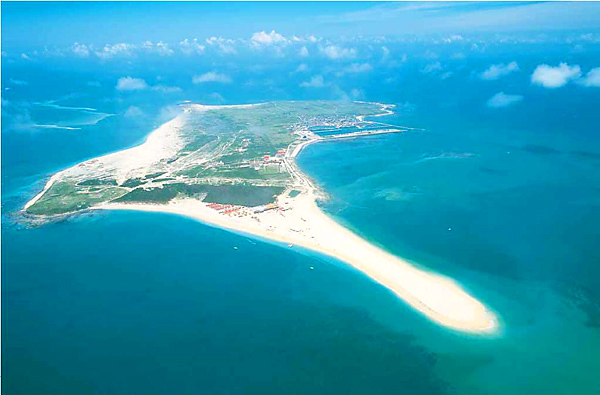 Jibei Island is also home to the spectacular Jibei Sand Spit 吉貝沙尾– a mini-penisula of sand that stretches out into the clear-blue waters for about 1.5km. This area is quite quiet – most tourists don’t really venture out into the sand spit because it can be quite a long walk in the soft sand. All watersports activity are concentrated on a beach further to the right of the sand spit, thus leaving the spit itself refreshingly devoid of people. The Jibei Sand Spit is located a few kilometres west of the ferry pier. This is what the Jibei Sand Spit looks like from an aerial view – see how long the sand spit is extended into the clear blue waters around Jibei Island. The small red huts in the picture (near the sand spit) is where all the water sports activities are concentrated. 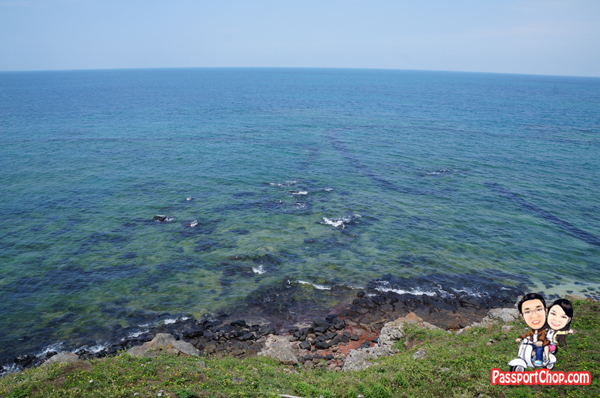 Photo courtesy of Penghu Tourism Office. 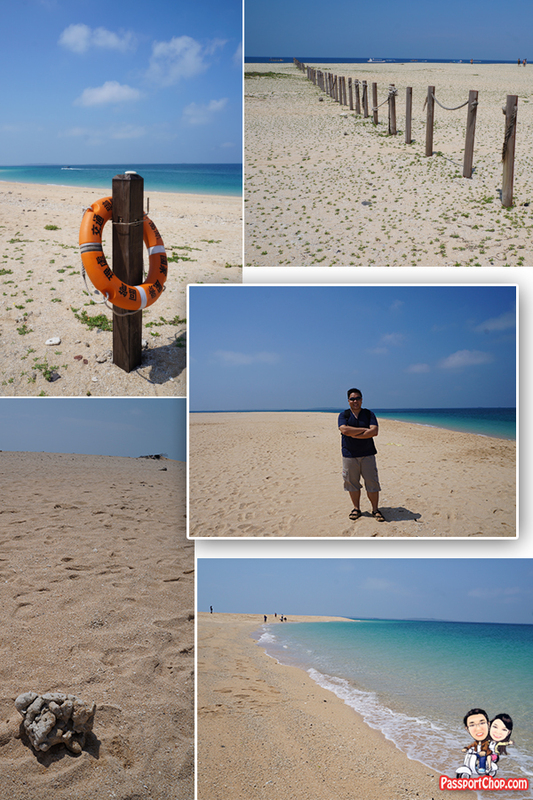 Besides the Jibei Sand Spit, most tourists come to Jibei Island for the water-sports (體驗水上活動). 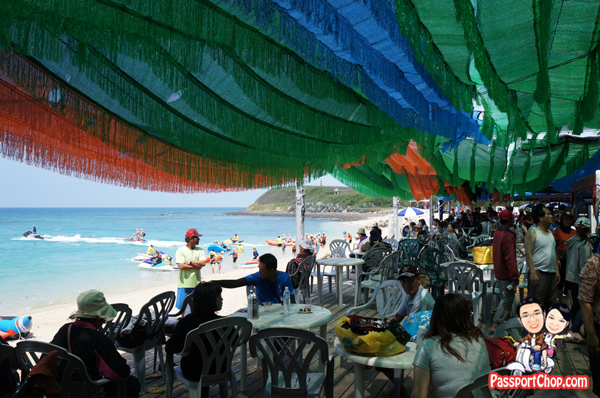 All kinds of water-sports equipment can be rented on the main beach at the 【吉貝海上休閒樂園】. Just like scooter rental, there are lots of water-sports equipment rental shops to choose from. What surprised me was how cheap it cost to play water-sports here at Jibei e.g. you can take a banana boat for just 200 NT and ride on a jet-ski (driven by water-sports shop staff) for just 300 NT (about 13 Singapore dollars). 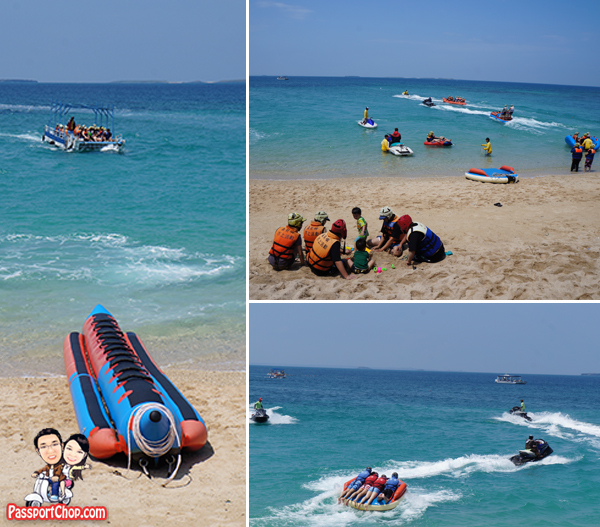 Similar water-sports activities at most beach resorts will cost at least 40-50 USD so if you haven’t tried banana boat or any of the fun water-sports before, Jibei Island is a good place to start. However, if you expect to drive a jet-ski, you might be a bit disappointed here – all the water-sports activities here at Jibei Island involve the participant being dragged across the waters in some sort of float, be it banana boat or a large mattress-like thing. At the water-sports equipment rental shops, there are lots of tables and chairs for waiting participants and their family and there are various BBQ seafood for sale too – it almost look like a mini-carnival or pasar malam here – very happening and busy. There are also lockers for participants to keep their valuables. Shower facilities are also available. Most people come to Jibei Island on a half-day trip – arrive at harbour -> scooter ride to sand spit -> walk along the sand spit for a while -> scooter ride to water-sports activities centre -> play some water sports and then they call it a day at Jibei Island with the boat ride back to Penghu main island. If you have some time, you can drive around the island in a scooter and check out the great scenery around Jibei e.g. the stone weir structure you see in the picture below – used by fishermen to catch fishes by trapping them in between tides. Check out this video from PassportChop.com Travel Blog Youtube Channel for a quick preview of what travelling around Jibei Island is like. For a quick and easy trip planning guide – check out our Day 2 trip itinerary created with Qiito. TransAsia Airways flies daily direct flights to Taipei Taoyuan Airport from Singapore. To get to Penghu, you can take the TransAsia Airways domestic flights from Taipei Songshan Airport.